High today in Pittsburgh, predicted to be 16F. Shoveled that 1″ of snow that fell overnight. Truth be told, I need a Winter Antidote, pronto! Opened my 2014 images, and this one is spot on. Butterfly Weed (Asclepias Tuberosa) was in bloom that 3rd week in July at Doak field (Raccoon Creek State Park, Southwestern Pennsylvania). 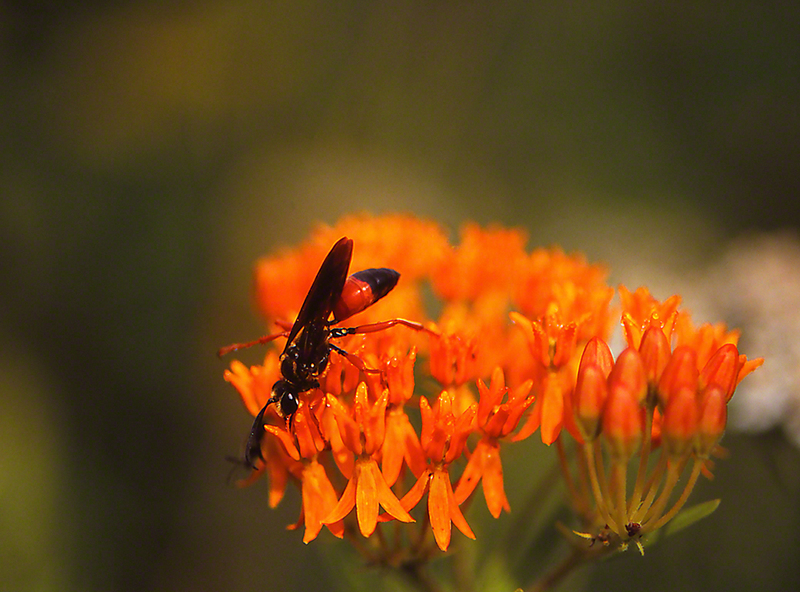 There were a limited number of these milkweeds, and they were the rich, deep orange that I love. In the morning, they are nectar pumps, and butterflies, bees, wasps, diurnal moths all pay visits to sip sweet nectar, their version of jet fuel. On July 14th I stationed myself alternately at 2 or 3 of the plants, and waited. The time spent was good. I was not alone much. Then, “Huh?” This wasp alighted on the blooms. A newbie for me, even after 18 years in the field. Then I saw it. That ½ orange/ ½ black abdomen. Orange delight! The perfect complement to the orange blooms. Beauty in the raw. Without a field guide at Raccoon Creek, I arrived home to find that this was a Great Golden Digger Wasp. “I beg your pardon?” This type of wasp is found throughout much of the United States and Canada, but solitary and surely uncommon. The adults nectar on flowers. They capture food for their larvae by paralyzing crickets and katydids and then dropping them into their burrows in the ground. July’s eye candy was painted in a natural orange tone that I love. I long to get back out there. I would love to actually take pictures of this milkweed blooming in the wild. I have myriads of shots of it blooming in my yard and at local nature center but have never found it on a nature trek. Butterfly Weed (asclepias tuberosa) is a great addition to any butterfly or pollinator garden as it is truly a nectar magnet. It blooms much longer than other milkweeds native to our neck of the woods, and is a compact plant that does not become invasive like common milkweed, so is well suited to small gardens and formal gardens. Common Milkweed (asclepias syriaca) and Swamp Milkweed (asclepias incarnata) are both much better choices to add to yards and gardens if you are interested in providing plants for monarchs to lay their eggs on.